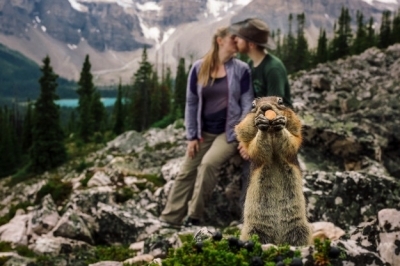 The Cutest Engagement Photo Ever! One of our favourite Edmonton wedding photographers, B.D.F.K Photography has found a slice of fame as a photo of theirs has gone viral and been shared on news sites from Edmonton all the way to Russia. Of course we had to share this adorable photo too because it really is the cutest engagement photo ever! 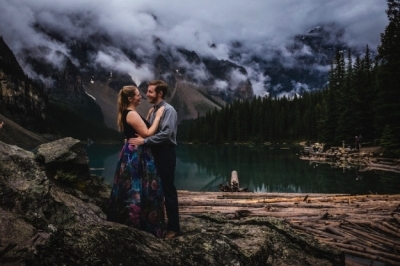 B.D.F.K Photography, Edmonton wedding photographers, had planned to head out to Banff National Park for an adventure engagement session with Kelin and Spencer. The plan was to hike all the way to Helen Lake for a gorgeous shoot high in the mountains, unfortunately, stormy weather rolled in and they had to change their plans. Instead of hiking out to the lake they stopped just off the trail in a rocky clearing to take photos before the weather got any worse. They noticed squirrels running around everywhere and some nuts had been left behind for them. They ignored the squirrels (who definitely weren't shy) and Kelin and Spencer continued to focus on looking their best for the camera, while their photographer continued to shoot. Eventually one of the squirrels stuck his face right in frot of the lens and B.D.F.K Photography kept photographing, knowing it could result in something amazing. And it sure did! The picture turned out so great even their own family thought it was photo shopped. We're still waiting for the full engagement session to be finished but if you haven't had a chance to check-out Edmonton wedding photographer, B.D.F.K Photograph's work before you need to head over and check them out here. 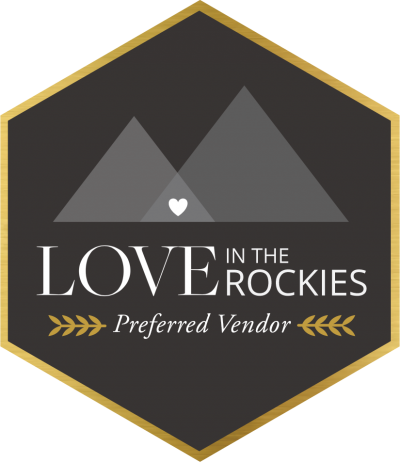 You can also read about their 5 Tips for Gorgeous Wedding Photos or Why You Need to Take Photos in the Mountains! Either way you will absolutely love their work and their incredible ability to capture powerful, impactful and emotional photos! We've Fallen in Love with This New Bakery!